Too many CISOs and IT teams rely on point products to defend their networks from the sophisticated cyberattacks. Many organizations remain burdened by inept tools built upon independent point products that are hampered by both manual processes and ultimately limited by a global cybersecurity skills shortage. A new holistic security approach – not more point products - is the best way to remove the noise they create. A solution to raise your security posture by increasing visibility and efficiency, while decreasing false positives is paramount to your success. 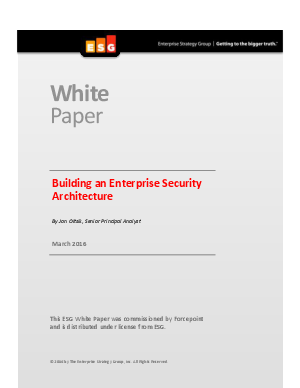 Deploying enterprise security architecture with control over enforcement, coordination, end-to-end visibility and process automation from a single pane of glass, is the winning approach. Download this whitepaper to learn 5 ways a security architecture will save your organization.